I don’t think I’ve mentioned it here, but in January I officially became a stay-at-home Mom. It wasn’t something I was really planning on doing so the last few months have been a bit of a scramble to figure out how I’m going to fill my days now. My best find so far? The local moms club. We’re hosting some new friends for a playgroup this morning. Tomorrow, we’re meeting up for stroller club. Wednesday is a tiny-person-friendly hike at a local park. Thursday, there is a playground play date. And Friday is mom’s night out – we’re going to take a wine glass painting class. I can’t tell you how much saner I feel when I get out of the house so having all of these things to do is pretty much heaven-sent at this point. It’s also a new audience to bake for. 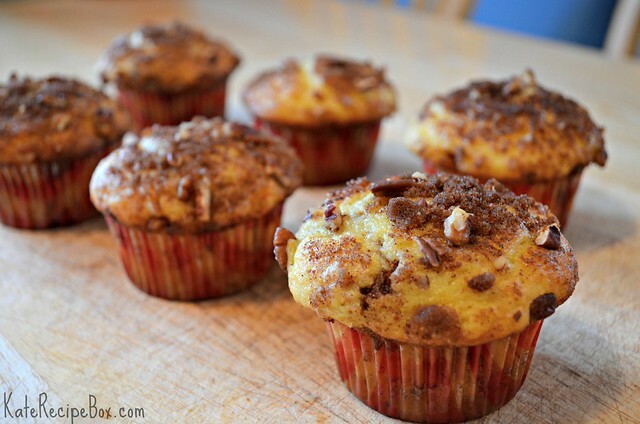 I made up these quick muffins for one of our meetings and I loved them. I’m planning to make another batch for Easter breakfast! In a small bowl, combine the brown sugar, cinnamon and pecans. Set aside. Preheat the oven to 375F degrees. Line a cupcake pan with papers. In a large bowl, whisk together the cake mix and flour. Add in the sour cream, oil, water, eggs and vanilla and mix until well combined. Spoon a heaping tablespoon of batter into each well. Cover with a teaspoon of the streusel. Top with remaining batter. Sprinkle remaining streusel over the tops. Bake until golden, about 25 minutes. Let cool in the pan for five minutes and then remove to a wire rack to cool for at least 20 minutes before serving.